Chelsea (1st place) and Crystal Palace (16th place) played a half of 11 vs. 11 and then decided that was too boring. Instead, each team received a red card before halftime and played 10 vs. 10 in the second half. Chelsea put on an impressive display and showcased their growth since the beginning of the season. Their fluidity and control of the game ultimately led to their victory. Lineups at the beginning of the match. Warnock’s men played in a deep 4-5-1 with the wide midfielders defending very wide and oriented towards Chelsea’s fullbacks while the central three stayed quite narrow inside. The fullbacks of Crystal Palace oriented mostly towards their opposing wingers and would press them very high up the field if the ball was on the near side while the remaining 3 defenders stayed central and quite narrow. 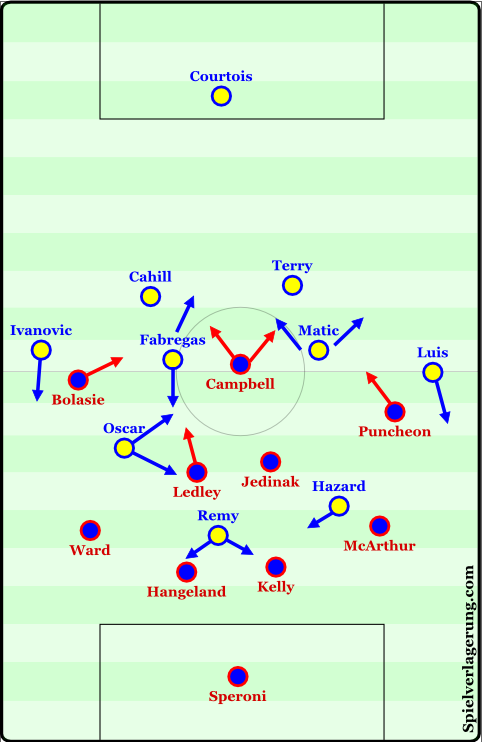 When the ball was coming out of Chelsea’s defensive line one of the Crystal Palace central midfielders would join the striker in pressing the two Chelsea central defenders. So Crystal Palace changed throughout various shapes while on defense. 4-5-1, 4-4-2, and 6-3-1. The 6-3-1 is of course a graduation of the 4-5-1 when the wide midfielders drop beside their fullbacks as Chelsea’s fullbacks push higher up the field. Palace mainly looked for long passes in transition to their front three. This led to some nice chances early on that could have changed the match. Whenever they had a goal kick or when they were able to control the ball possession when building from the back, Palace looked for long passes forward to a surrounded area where they would look to win the ball and press the 2nd ball. This was Crystal Palace’s main path of attack and it didn’t prove too successful vs. Chelsea. Chelsea played in their usual 4-2-3-1 formation. Though it was played incredibly fluidly and much better than we have seen earlier in the season. During the build-up phase Matic would situationally drop between the central defenders, but he would mostly drop between the central defender and the left fullback. Cesc Fabregas was the player who was most often dropping between the central defenders. The two Chelsea defensive midfielders created a large superiority when building play and it was quite easy for them to progress vs. Palace’s 1 striker and supporting central midfielder. When Matic dropped between Terry and Azpilicueta the leftback would push very high up and Hazard would move inside. On the opposite side Ivanovic also pushed high up the field with Willian moving inside and situationally moving very deep to build play – even into the 6 space. Oscar mostly balanced everyone elses movements. When Willian would move very deep, Oscar was moving higher and towards the right flank. When the game required extra presence in the buildup phase he would drop very deep and help move the ball forward. Remy played as the focal point of the attack and a ‘swerving forward’ similar to Diego Costa. He would make many runs towards the flanks to open and attack space. It is obvious that Chelsea had a severe superiority in the center. 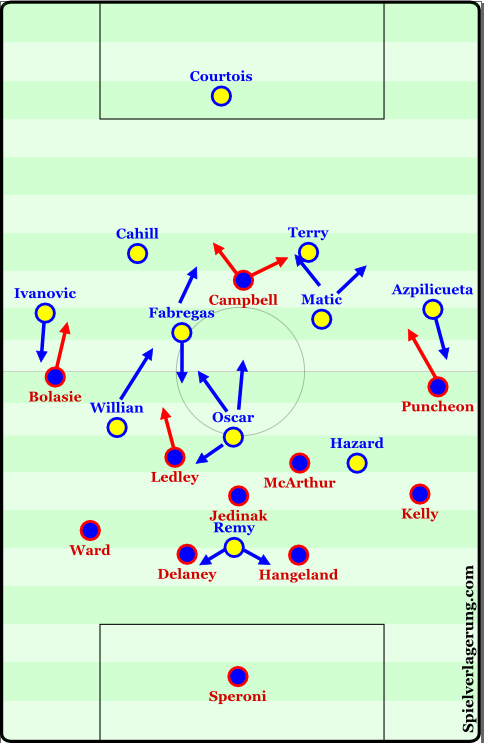 All 5 of their midfielders moved fluidly in and around the center and halfspaces – which were left especially exposed due to Palace’s wingers being so focused on the wide Chelsea fullbacks. Usually when a team has man marking aspects drifting wide is an excellent solution as it opens up even more space in the central areas. Here it happened naturally for Chelsea. Though at times Chelsea lost the ball from dangerous areas which led to dangerous breaks by Palace, mainly Cesc in tight areas (where he struggled at Barcelona). Mourinho always kept a superior amount of players behind the ball even in possession in comparison to Palace’s strikers in order to remain stable. Chelsea’s counterpressing was inconsistent, though this didn’t end up having much of an effect as Mourinho didn’t commit many numbers forward. When Mourinho’s men didn’t have the ball they set up in an (improved) compact mid block. They moved very well as a unit and maintained connection to each other. When the ball was won Chelsea was very patient and didn’t force any passes, opting to maintain possession of the ball. Lineups at the beginning of the second half. In the 40th minute, Azpilicueta received a red card for an awful tackle – causing Willian to be taken off and the awesome Filipe Luis to come on. Only a few minutes later the very scary Delaney managed to earn a second yellow. Both teams from that moment on played in 4-4-1s with Chelsea being the more fluid and dominant of the two once again. While defending with 10 players Mourinho’s men played in an interesting 4-4-1 or 4-3(wide)-2 with Cesc joining Remy in pressing leaving Matic alone in central midfield. This didn’t last long though as Chelsea rarely had to defend without the ball. Crystal Palace attempted many long passes and to build up down the flanks in order to cross. This was ultimately an inefficient means of attack. Palace had an interesting 4-4-1 or 3-3-3 when attacking. This was due to the wide midfielders joining the striker in order to better compete for long passes while one of the fullbacks of Palace moved up into midfield during these long passses from the back. Chelsea was interesting even with 10 men. Matic still looked to dropped into various gaps in the back line during the building phase. While Oscar was moved out towards the right, he mostly vacated that zone and allowed Ivanovic to control the right flank while Chelsea maintained superiority in the center. Filipe Luis also pushed high up the left flank while Hazard moved inside. Fabregas had similar movements as in the first half while also making forward runs and even positioning himself very high up the field between the lines. An amazing spell of possession where Chelsea had Oscar, Cesc, and Hazard in the center and the ball switching between Luis, Matic, and Ivanovic in one line manipulated the Palace defense very well. When Palace shifted across towards Ivanovic the ball was moved back across to the left side of the field where Hazard, Oscar, and Cesc combined quickly to penetrate the vulnerable zone before Cesc calmly finished his 3rd man run with a goal to go 2:0 ahead. In the end Chelsea deserved the win. They had roughly double the amount of shots (14) that Crystal Palace managed while maintaining 72% of possession. They controlled the game well all throughout the meeting. Mourinho’s team is shaping up nicely and getting better with each game. This will most likely be a team to watch out for in the Champions League!